I called him after 5 years. With maximum restraint, I was feeling like my heart was beating in concordance with my thoughts, its whirl was almost overwhelming. It was really weird, He did not change his phone number, I feel like He was still waiting and craving this moment. 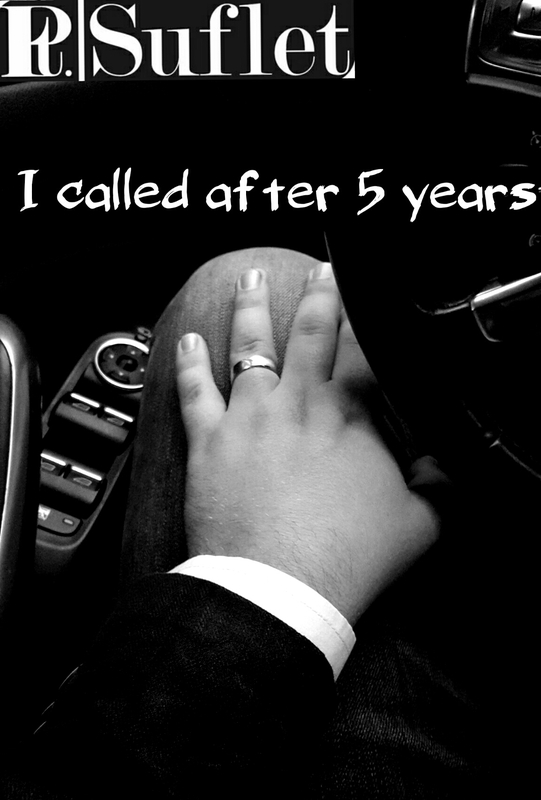 When He picked up the phone, at the end of my overwhelming waiting, my being was shaken. –I am wondering what was on His mind? His voice seemed warm and unchanged, when I heard Him saying “Hello” my breath stopped, I had no more words, I did not know what to say. Only then I understood what I have been looking for in all of my relationships. I could have not been happy next to anybody else. The inherent happiness that I was experiencing in those moments, that I am finally hearing Him was ruined by the fact that I was hollow… I immediately realized that the only thing that was missing from my life was Him. I remember Him saying, when we saw eachother 5 years ago that He will always love me, I gave up anything that was connected to Him, I cannot regret anything more than I regret the moment that I left and left everything prey to the fate. That “hello” left me immobilized, with the phone in my hand, phone that could not tell everything I had in my head instead of me, I could have not resisted, I hung up. “Do you know for how long I have been waiting for this phone call? I was hoping I could hear your voice but I feel that most of all you are unsure of what you really want. That will lead o nothing good, you still do not know what you want! I called immediately after, it was too much for me, I did not want to stand that ingrate situation anymore, but my attempts to call again and again were unsuccessful, I could not reach him. I also tried to call the next days. There wasn’t nobody that could have given me the consolation that I needed by only answering the phone. As soon as I said I would not think about that anymore, I was overwhelmed with questions! -Is he still mad at me? He must have understood that I left because I no longer felt that I could find myself in that relationship. -Is he really not able to get over this? I mean…Why should I blame myself for something that can go away without trying to be solved, maybe he is just trying to be a male for once. Hardly I could have make up my mind about him. At that time, He was really different from me. Maybe that is why, dreamy, well-mannered, deaf when hearing advices about love…he was irresistible. When we were a couple, he was a very impractical guy, impractical but so damn handsome. I want to say that not once I have forgiven this obnoxious man. Oh god, how many times he has exasperated me, I think that he is by far the most immature man, for me to find later that he was indifferent with me. More than likely that he lived only for his respect and self esteem, a selfish, insensitive sun that goes down and just loves Himself so much. – Is it possible to still love him? If someone told me that I would give myself up until I will forget of my being, I would never have believed it. In fact, he should weigh all the arguments, I offered him everything from the first moment. Even now, with all my heart I daydream as I held his head in my arms, as my fingers played in his hair, as I touched his lips and get them ready for kisses. Oh no, memories again … memories that exasperate me downright! But they are only memories! No, I do not love him anymore, accept him no more, no, I do not want him no more. – No, I will not accept him back so easily! I will have to make him understand that He actually wants me back! Maybe, I will accept him so I can reject him away, I will give him the opportunity to suffer … I will be vindictive and leave him in oblivion! Surely his eyes have not forgotten how beautiful they used to capitulate in front of me and caressing my body every time they saw me. – Pfft, how it is possible that his memory still causes such a tremor in my being. I need him, how long can I still want him so much, I will certainly read on his face again the love that he carries for me, this sweetheart. – What is on his mind? Full book in digital format! – What is in Her mind? When that phone rang, I think I confused all of the thoughts that I have laboriously put in order. I crossed the strongest rigor that may exist in the mind of a man. Now I’m wondering what we do, who does she want to disrupt worse? – Was it again a treacherous game of hers? Did she said I bewildered her in everything she represents? No, this woman was dangerous, if she did not want me back surely she wanted to assure herself that I am not doing well. – Should I get revenge? No … if I did this, I would have been no better than she was. So many emotions went through me, or maybe I did not feel anything anymore, or more correctly would have been to stay a true gentleman until the end? It would have been appropriate, perhaps because I still felt the taste of her lips, her flavor in my hands,her flavor in my nature. – I had no words to tell her so that she will not be faulted, absolutely none of which were not charged with the pain that I have experienced. I had no idea how to say what was not said in those five years and all of the thoughts that have plagued me during her absence. But I was definitely sure that she understood, above all, that she actually still loves me !!! – But would I have been credible if all the words that I told , show just indifference? Certainly she knew me so well, that there was no point for a lie! That I have not had time to think, that I never loved her, that I did not love her enough or conversely that I no longer loved her! What can I say, I would be simply lying to say that I no longer want her!!! – But where were all those triumphant, warrior struggles, ready to face any unrestrained emotion which could have arisen now in her presence? I was annoyed by what I felt! Her eyes were tired! Her eyes contrast with her face which normally enjoys the thought that I will have never be seen again. Her eyes were the only ones who did not lie! I was sitting comfortably thinking then, when the first year passed, though getting used to the thought that my life would be without her and that whatever it is, I must go further, and now what am I doing, after so many years, passing just over it, over the convenience of situation, over my ego? The subsequent period filled with various women, their faces drawn on the canvas of my soul. These days surely I could choose, at any hour, any other Her. However, it has been 5 long years and now she came back with fantastic guts as if nothing had happened? I did not hear from her for a long while, and my love for her, certainly … was betrayed! If I would have gone to her, what would I have said? Everything is ok let’s resume life from THAT moment? What was I living then? Lest I be punished my very own being that after so many years, in which she surely worked her life without me, I simply invite her back in my heart? She had left me! So many times I needed her at the time, to take her in my arms, to stick her to my soul, to find myself in her, but she was gone! Not me from her! It’s clear that she now realizes that when she left she made the biggest mistake. She gave me the opportunity to realize what kind of person she really was. I desolated my existing at the time and now all those moments are grinding me. Simply I vowed then that she no longer exists, I could not accept her return. At that time it hurt the most. Now when she tries to return to my soul, now I realize that I really lost her being. I thought I had to choose between being understood as a fool or as insensitive or just as a sentimental buffoon. I was wrong. Now I have an alternative. I can always choose to be what I became.